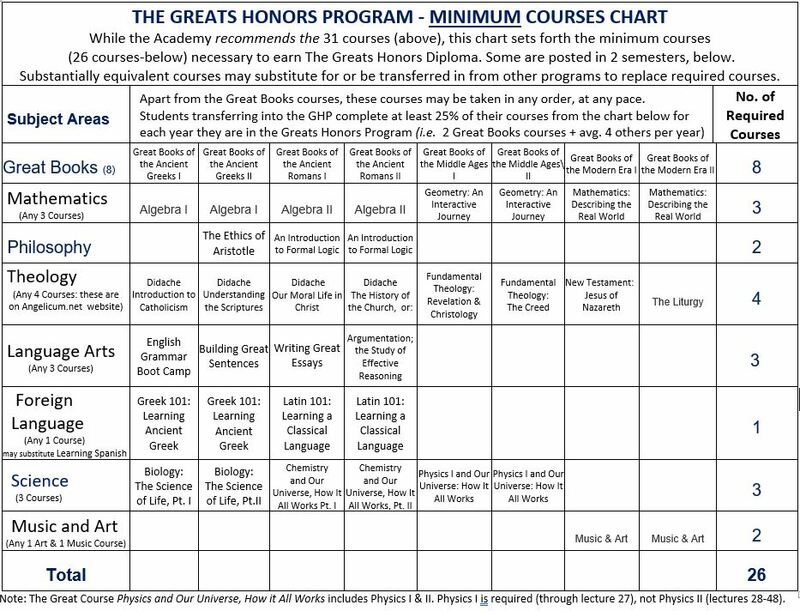 To complete the entire Greats Honors Program-the goal for a complete liberal education-requires completing the courses on the curriculum chart (HERE); or substantially equivalent courses [even if named differently], which may be transferred in from other programs). The courses may be completed in any order: the order on the curriculum chart is simply a suggested order. They may also be completed at any pace the student desires: again, the curriculum chart merely offers a suggested pace, not a required pace. To receive The Greats Honors Program diploma evidencing completion of the high school honors program, students must complete a minimum of one year (two semesters) and at least 25% of their courses while enrolled in the Greats Honors Program, and including a minimum of one year in the Great Books Program. The other courses may be completed elsewhere, provided they are reasonably similar courses, of high school level or greater. Simply contact us for any help needed in determining what courses taken elsewhere qualify–we use a flexible, reasonable approach. Students interested in substituting some other of The Great Courses Plus™ for one or more of those listed on the GHP curriculum chart #2, not already listed as acceptable substitutions, may request permission to do so, which will ordinarily be granted for up to two such substitutions, provided the courses are academic in nature (e.g., not cooking classes) and of approximately the same number of lectures. For example a student may be more interested in history than math, and so may wish to substitute a history course for Precalculus and Trigonometry. More than two such substitutions requires special permission. Students interested in substituting some other of the Great Courses for one or more of those listed on the GHP curriculum chart #2, not already listed as acceptable substitutions, may request permission to do so, which will ordinarily be granted for up to two such substitutions, provided the courses are academic in nature (e.g., not cooking classes) and of approximately the same number of lectures. For example a student may be more interested in history than math, and so may wish to substitute a history course for Precalculus and Trigonometry; or another theology course in place of the second Chemistry course (Our Universe and How It Works). More than two such substitutions requires special permission. Our 4-Year Great Books Program satisfies the Social Studies and English Language Arts requirements, as it is both the core of our educational approach, and “the backbone of a liberal education.” This interdisciplinary program, which studies 120 great works of Western civilization over four years/8 semesters includes great works of literature, history, philosophy, theology, poetry, political science, social science and psychology. Consequently, it includes the substantial equivalent of four years of English language arts courses, and three years of social studies, inter alia. It includes much more as well, but students who take this program do not need to take additional English language arts courses (assuming they completed 8th grade grammar) or social science courses to fulfill our graduation requirements. They are of course free to do so – and we do offer such courses – but for them it is not required.In more detail: the Great Books courses include much Ancient History, World History, US History, US State Papers/Civics, Western Civilization, World Literature, English Literature, American Literature, Poetry, Shakespeare, Ancient Philosophy, Political Science, Psychology, Vocabulary. See HS credit chart HERE.